It was bound to happen. I bought this yarn for the blanket I’m working on – but of course I got distracted. I’ve been looking for a good water lily pattern for a while, and whilst I’ve seen a few most of them require sewing several layers together. Also, most water lilies I have seen have 8 petals around – but most of the patterns out there use 6 petal repeats. A minor detail I know, but it’s nice to be accurate! The pattern is worked in the round from the centre out. The stamen and petals are worked into the front loops of the round before the next increase of the base circle is worked into the unworked back loops. This means no sewing together later! Begin with yellow yarn; make a magic ring. R3: (Work in back loop only (b.l.o.) of each st in R1) Ch1 (does not count as st), 2sc in each st around, join with a sl-st into f.l. of 1st sc (16sts). Fasten off and join white yarn. R5: (Work in b.l.o. of each st in R3) Ch1 (does not count as st), *2sc, sc, repeat from * around, join with a sl-st into f.l. of 1st sc (24sts). 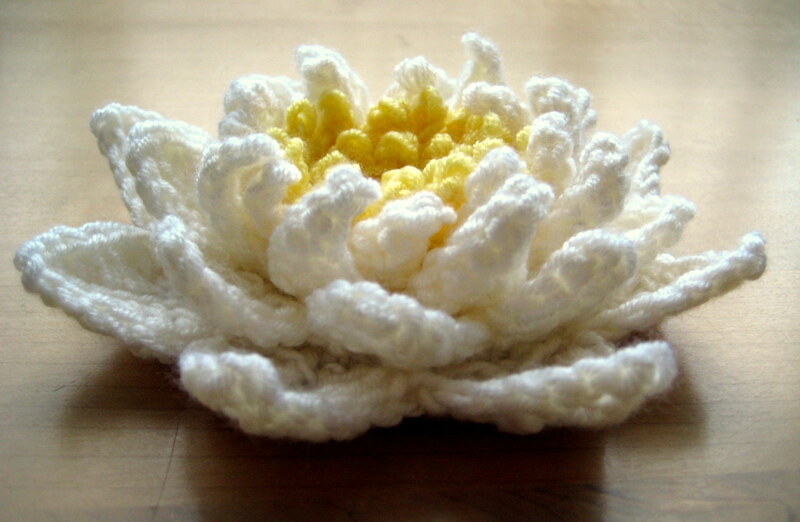 Tip: If you find that your petals curve to one side, try crocheting your chain more loosely or tightly to correct it. Completing R6: Petal prior to final dc, after final dc, after sl-st, completed round 6. R7: (Work in b.l.o. of each st in R5) Ch1 (does not count as st), *2sc, sc, sc, repeat from * around, join with a sl-st into f.l. of 1st sc (32sts). R8: Ch1, sl-st in f.l. of st behind (i.e. the last sc of R7) – this will stagger the next row of petals from the row just worked. R9: (Work in b.l.o. of each st in R7) Ch1 (does not count as st), *sc, sc, sc, 2sc, repeat from * around, join with a sl-st into f.l. of 1st sc (40sts). Round 10 makes “arms” which the next set of petals are worked into. Most people work into the back loop only when working down a chain. I suggest you do that here because on R11 you can then work into the front loops of the chains! R10: (Work in f.l.o. of each st in R9) *Ch6, slst in 2nd ch, 4 more sl-st down chain, sl-st in 1st st, sc 5 times, repeat from * 7 more times, omitting last sc, sl-st to join (8 “arms” made). Round 11 is worked around R10, working up and down the arms to make the penultimate row of petals. When working up the first side of the “arms” you should have back loops available from the chain. When working down the second side of the arms, it is easier to work into just to back loops of the sl-sts. This also leaves a nice ridge up the centre of the petals. If you prefer though, you can work through both loops of the sl-sts. R11: Turn work and sl-st twice so that you are starting the row from between the two arms. Turn the work back to work into the first arm (there will be 5 chains, ignoring the turning ch). *Work into each ch as follows: (dc, dc, hdc, sc, sl-st). Now work back down the other side of the arm – you can chain 1 here if you find it difficult to turn – (sl-st, sc, hdc, dc,dc). R12: (Work in b.l.o. of each st in R9) Ch2, sl-st into b.l. of 1st st in R10. Ch1 (does not count as st), *2sc, sc, sc, sc, sc, repeat from * around, join with a sl-st into f.l. of 1st sc (48sts). R13: (Work in f.l.o. of each st in R12) *Chain 7, turn, sl-st in 2nd ch from hook, 5 sl-st, sc 6 times, repeat from * 7 more times, omitting last sc and joining with a sl-st (8 arms made). *tr, tr, dc, hdc, sc, sl-st, ch2. Now work down the 2nd side of the arm: sl-st, sc, hdc, dc, tr, tr. Sk 3 sts, sl-st (into the middle st between the arms). Repeat from * 7 more times. If you wish to block this piece, I recommend steam blocking. I just made one. Very real looking. I like it very much. Thanks Marian! I’m glad you like it! This is captivating. simply gorgeous. I hope I can make it. Thank you for sharing this pattern. Aw, they look really pretty, and very realistic too! What a lovely design! And your photos, both of the mirrored flowers and the process photos, are excellent! I absolutely love this project….work smarter not harder! You are a very talented, creative person! Thank you so much for sharing your genius with the world! God bless you! Thank you this is beautiful. I.hope to use it on an Afghan. Thanks Connie! I think this would be great on an afghan! These look gorgeous! I love how realistic they are put together. Even the way the petals form. The inside is great too. I can see expanding the center area to make great chrysanthemums. 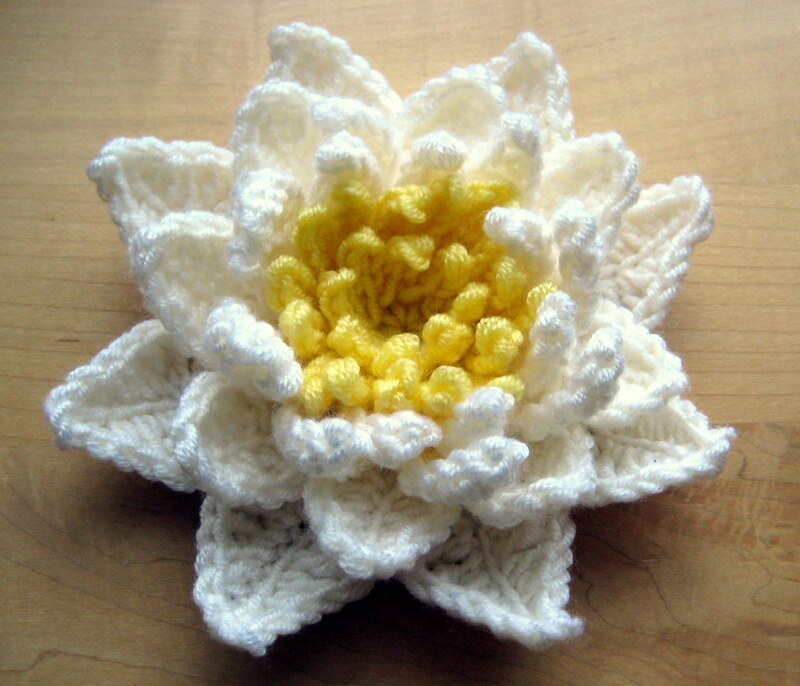 I loved the water lily so much I made one today. I turned out beautiful. I used pink instead of white. OMG! U had me @ purple! Hi, it’s Dee, again. I put down your sweater for a few months because life & the holidays got in my way. However, I was recently gifted 2 lovely colors of purple & decided that I must @ all costs finish it by 3/31/14. But this water lily, it’s exquisite, & my flower. July’s flower.I love your creativity! Keep up the phenomenal work! Wheels are turning & I’m thinking to make this into a corsage to wear with the sweater. Oh! I’ve said too much… can’t wait to show you though. Email me? Haha well I’m glad you like this! It’s a quick project so good for a minor distraction. I hope your corsage turns out well! Absolutely lovely and what a crochet genius you are! I am going to make this for a headband. I know it will be just great. I absolutely love your design! The first ones I made were not exactly the same as yours, but I made them into squares. I just made another one and this time I was able to follow the pattern correctly :) I am turning this into a square also. Thank you so much for sharing your pattern. Hi Ofelia! That sounds great! I was wondering about turning them into squares myself. I hope you’re pleased with your end project! It turned out great, here are the squares I have made. The 2nd and 3rd ones are missing a round of petals. Thank you again for sharing this lovely pattern. I am a little confused. In R6 are there 2 sc in each stitch worked in? (one at the start of the petal and one at the end) Also do you skip any of the stitches? 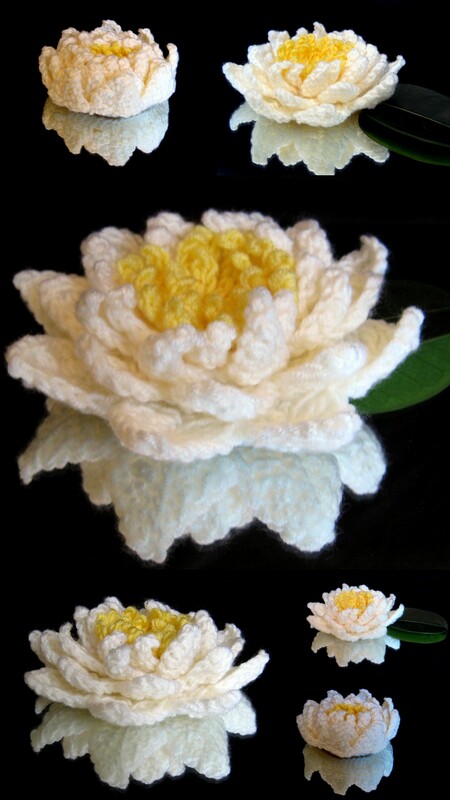 You must since there are 24 stitches in R5 and only 8 petals in R6. Thank you for your help. Hola disculpe no entiendo ingles. Crees poder mandarme el patrón a mi coreo en español .. La verdad me gusta Mucho esa flor . mi coreo es auravelasco@rocketmail.com .gracias . att.aura. 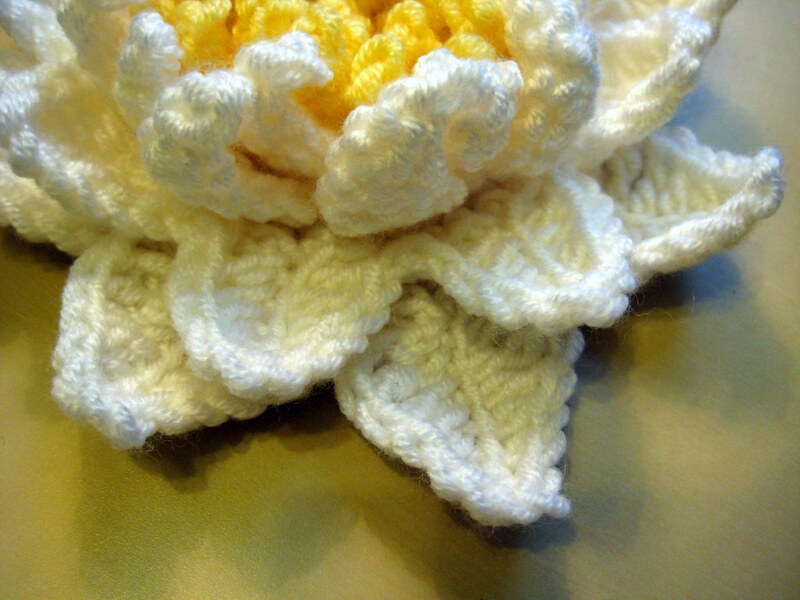 This is one of the prettiest water lily patterns I’ve seen! Thank you for sharing your talent :) But I don’t see the finished size. ? Thank you! I needed to know if I could up the size to aran/worsted, but it def needs to stay DK. And that lets me know even with DK it will still be too large to put on a lily pad granny square I am doing now. But I am definitely making it for another afghan I have coming up I’m making for my mom! I agree with Flory, a video tutorial would be great since I can not read a pattern. Everything I have learn has been through watching others as they explain or youtube videos. I love the way you made this and would love to put it on my Princess and the Frog tutu dress I am making. I am going to see if I can figure out your pattern. I commented on Oct. 22 and I would like to update on that comment. Because of this flower I had someone teach me to read a pattern over the phone and made this lilly for my daughter’s tutu dress for Halloween. Thanks for sharing your pattern. Thanks Helen! I’m glad you like this! Good gosh! That is a drop dead gorgeous flower! One of them will find itself on a hat for sure. Probably several hats. And, goodness know, lots of other crocheted pieces. Beautiful! I’ve used it to make a headband for my daughter and now making another one as a birthday gift for another little girl. Thanks for sharing! Hi Marta! These sound lovely! I’m glad you like this pattern! I love these flowers. Thank you so much for sharing the pattern. You have been blessed with a beautiful gift (talent). I am so happy that you are sharing it with us (me)! Hi Esther. I am translating your pattern into Dutch. Would you be interested in it? OMG I’m falling in love with this pattern!!!! I’m a HUGE FAN OF THIS FLOWER!!! I crochet since I was little around 3 to 4 yrs old. Now I do 1 bedspread every month and save them. I’m sick of doing the same thing all the time but I can’t stop cause I love crochet. I can’t believe I have a new flower to try. I hope, it’s easy and understandable to do or follow the pattern. Thanks a lot and that make my day!!! Lot of appreciation!! !